The Helloworld Travel agency in High St.
A TRAVEL agency has popped up in a former banking chamber that will soon be seen on television as the fictional Midlands Bank on ABC's Rosehaven. The Hobart branch of Helloworld Travel has today opened an agency in the former ANZ Bank at 24 High St, New Norfolk, on a trial basis for three months. The bank closed late last year and has been vacant since then, other than some filming for Rosehaven several months ago. Now open on Wednesdays and Thursdays from 9.30am-4.30pm, owner Stacey Nation-Daley will be available to provide assistance with all types of travel services including flights, tours, cruises, trains, hotels and more. Drop in, call 6234 2699 or email hobart@helloworld.com.au. 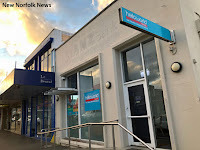 Helloworld Travel is a national group that was previously known as Harvey World Travel, which had an agency in New Norfolk in the 1990s.